By the way, I never go anywhere without my “NEW ISRAEL ROAD ATLAS” an excellent atlas full of interesting information, and excellent easy-to-read maps with distances and translations of words and other information as well, like interchanges and mountain heights, etc. I have a couple of the “big” size in English, and also the smaller ones, and also 1 small size in Hebrew, which is more up-to-date. Okay, now that we have a map-atlas, and we are leaving Ir Ovot, we will “fill-up” at En Hatzeva, and while we have a coffee, before we carry on north I’ll reminisce a little, and explain a few places that I rode on previously. A few hundred meters further on [out of curiosity] I rode on the other side of the highway into this deserted military base [sign Be’er Ora ], and I found everything just ”rotting away” in the open, I saw some faded writing on the walls of the wooden buildings [U S Army] [Marine cap log ?] and many useable items of clothing and buckets and chairs etc. just dumped in a big mound, but no person to ask some questions. [I imagined the place to look exactly like a Hollywood film studio set]. Another short ride north again I came to and wanted to visit the new giant landfill, but without a permit I was not allowed to enter, and there I learned that Be’er Ora was being rebuilt to be a new neighborhood, with luxury apartments and homes in this oasis in the middle-of-the desert. At this spot I also watched several eagles floating in the thermal, not very high, and giving me a marvelous”performance”. Just before ending that little drive, I went to Kibbutz Elifaz [ next to Timna ] where I discovered some South Africans have settled, and also other S. African volunteers work in the dairy and do all sorts of chores. They also have some lovely chalets that are for bed and breakfast accommodation, and on and on, I go, and I get all this info, to look and imagine. Continuing north, I specifically bypassed Kibbutz Yotvata and the Yotvata Reserve as I would need more than one full day to visit those places in the kibbutz, and in the “KHAI BAR”, (also called the Yotvata Salt Desert), where a variety of animals roam free. On an earlier visit I stopped for coffee and a short visit at 101 INN where road 90 meets 30, but the visit was not long enough, but I did learn some most interesting facts about the owner, who was in a parachute unit (101) and at some time (many years earlier) he was granted some land, and he chose this spot being 101 kilometers from Egypt border at Taba Crossing in Eilat, and that he flew a paraglider into Jordan, and met with the Jordanian King. SO now we will ride north to MASADA, and on the way I made quick look-see visit to moshav Ein Tamar and found a lovely shop that sells pottery and art, then another quick visit to Ne-Ot Hakikar where I visited a home that advertises bed and breakfast accommodation, and after a coffee and chat with Malka, I carried on. For my scootseeing, riding a few kilometers out of the way is never a problem, and I see a few more places. A quick stop at the Regional Council offices in Neve Zohar, and took some maps, and rode to Ein Bokek, a resort with many very smart and very expensive hotels, with every amenity for leisure and pleasure at the Dead Sea. My budget allows for coffee and a cookie at a local outdoor eating place, then more scooting and stopping to look-see, a short stop at some rock sculptures, then into the Masada National Park complex, and the brand new Youth Hostel at the foot of the mountain in this quiet desert, where I always stay overnight in a dormitory, and that comes with a great breakfast. On July 18th 2000, I was scootering around the Dead Sea areas, and sleeping at youth hostel at Masada. I decided to go with the cable-car to the top of Masada, and spend 1 hour walking around ? I remembered that I had visited the top on a previous visit in 1975. I had with me a little book I bought in 1975, titled THIS IS MASADA , and when buying a ticket for the cable-car, I showed the book to the ticket-lady, and to my absolute amazement she noticed that I had bought the book exactly 25 years earlier on the same date, July 18th 1975. [The Masada date-stamp is in the inside front cover ]. So she ran to show the book to the manager. He was too busy to come-out to say hello. I took the cable-car and when I got off I knew there are many steps still to climb, and after a slow painful climb reached the top. At the entrance one of the staff called to some others ” That’s him” ? then Shlomi [maintenance manager] who spoke pretty-good English, came over and “welcomed” me. Shlomi invited me into his workshop, [in the wall], sat me down and with a few of his staff, and together drank coffee and ate cookies! Then Shlomi gave me some maps [of Masada] and told some tour guides and tourists about this man who rides the scooter! Now this becomes interesting, I rented headphones, that when you press a number you listen to the story about that particular spot where you are standing. Now this was so interesting, listening to the stories, that I stayed another 6 hours [ not rushed by a tourguide] and really understood about the place! Every so-often one of the staff checked-up on me and brought me cold water, and insisted I join them to eat and drink. I was overwhelmed by the hospitality of the staff at these different places on the top of Masada. Its amazing how popular a scooter can be. 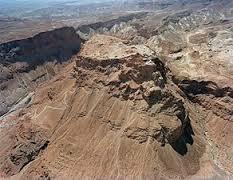 You can visit many Masada sites on Internet.